You may or may not have heard of the highly innovative Webnet frames, created by Jacob AG in Switzerland. 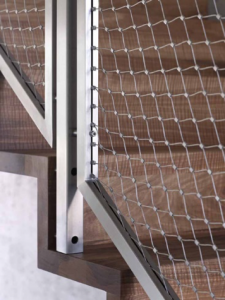 The Webnet product is a stainless steel flexible net structure that consists of ropes and metal sleeves. 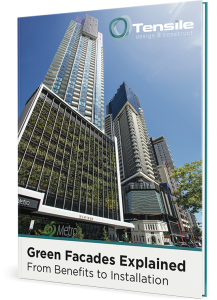 While it initially had very limited uses, it has expanded its usability to many different applications such as dividing building zones, serving as a fence, filling in staircases and as a training structure for plants. The highly innovative design of Webnet frames allows for it to be used in a variety of interior applications, not only aesthetically but from a safety perspective as well. This article will show you how you can use Webnet for indoor applications. Webnet is a great tool to use for dividing rooms into different sections. Webnet has been used in gymnasiums and sports clubs to create barriers between different areas of the facility, where one section can be used for one sport such as basketball, and another section used for a different sport such as netball. Webnet can also be used to provide a protective barrier against damage to the facility’s lights (hanging from the ceiling) by being placed right beneath the lights. Webnet is the perfect addition to your interior stairwells. It can be used to provide a protective barrier on the sides of the staircase and replace the need for railings. Its ability to be shaped into various 3-dimensional structures makes it an aesthetically appealing option for balustrades in staircases. Long stairwells such as those present in apartment buildings can benefit greatly from unique Webnet designs. Your balcony will never look the same again with Webnet. It can act as a fence for your balcony, which you can shape into many different designs that are unique and creative. You can also vary the mesh size and diameter of the Webnet in order to match your needs for protection, design, and shape. Webnet also provides a safety aspect to an installation. The frames are sized to specified dimensions and completed with Webnet infills. All components are made of high-grade stainless steel (AISI 316). Because they are made of stainless steel Webnet Frames are suitable for indoor and outdoor applications. Webnet is safety certified, weather resistant and highly durable and requires little to no maintenance. The versatility of Webnet allows you to create 3D structures that can add functionality indoors. You can create shapes such as cylinders, spheres, and funnels which can be used as baskets, decorations, toys, and climbing guides for your indoor plants. In conclusion, Webnet’s flexible and innovative design allows it to be used in many interior applications. In addition to those listed here, there is no limit to the creativity that one can envision for the use of Webnet in indoor applications. If you are looking for ways to diversify internal spaces or have some safety elements to comply with, speak with our design team here.